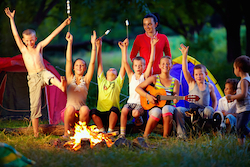 Summer Camp Accidents | Nashville Personal Injury Lawyers The Law Offices of John Day, P.C. Summer camps are a 15 billion dollar industry according to the American Camp Association. With swimming, horseback riding, rock walls and other fun physical activities, it is easy to see why more than 11 million children and adults attend either a day or overnight camp each year. But with these types of physical activities, is also easy to see how someone may get hurt if proper procedures and safeguards are not used by camp staff. Summer camp injuries can take many forms including brain injuries, bus accidents, food poisoning, food allergies, sexual abuse, drowning and near-drowning injuries, burn injuries, spinal cord injuries, etc. Summer camp accidents also present a number of complex legal issues. Most summer camps have some type of waiver in the registration document. In Tennessee, these waivers are often not enforceable against the child but it is important for your documents to be reviewed by experienced attorney as other issues may arise. For instance, some registration documents or waivers also include an indemnification provision. This means that if child pursues an injury claim then the parents who signed the documents may have to actually reimburse the summer camp for any losses associated with the child’s claim. While this is crazy, some summer camps use these provisions so it is critical that you have one of our award-winning lawyers review your documents for these types of issues. Additional legal issues involve both the recreational use statute and agri-tourism immunity. Both of these Tennessee statutes provide certain defenses and immunity to some camp accidents. To learn more about these statutes, click on the links above or you can call us to discuss whether these apply to your case. If your child has been injured at a summer camp and would like to have one of our experienced lawyers review your case and documents in a free, no-obligation consultation, simply call us anytime at 615-742-4880 or toll-free at 866.812.8787. We handle all injury cases on a contingency basis so we only get paid if we recover money for you.